Feeling lazy after a long day in the summer sun? Replenish, refresh, and re-energize with this thirst quenching Watermelon Beet Energy Juice! If you’re familiar with juicing you’ll know just how great juices can be for energy. Juicing removes the insoluble fiber from fruits and vegetables which allows your body to quickly breakdown and absorb their nutrients. You’re also able to pack much larger servings of fruits and veggies into juice than you could easily consume in a smoothie or by just eating them. This leads to a quick flood of nutrients into your bloodstream and results in a nice clean energy boost. Just be careful to avoid juicing fruits high in sugar or you could spike your blood sugar! Here’s more tips on juicing and how to do a cleanse. 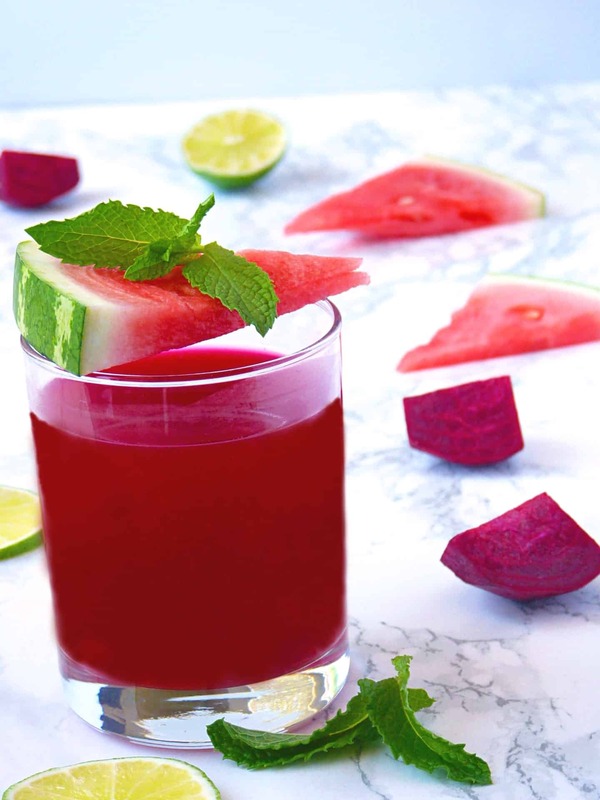 This watermelon beet juice is specifically packed with nutrient rich and energizing ingredients making it one of the best juice cleanse recipes for energy. Beets are the star of this juice. You’ve probably noticed beets popping up in natural pre-workout drinks or energy boosting supplements and for good reason. Among the myriad of health benefits that beets provide, they are also an excellent source of nitrates which are converted into nitric oxide in the body. Nitric oxide is a common pre-workout supplement for it’s endurance and stamina enhancing qualities. Spinach is known for being a healthy and nutrient rich leafy green, but did you know it can also help to boost energy? So what does this have to do with spinach? Spinach is a great source of iron with nearly 20% of your daily value in just a 1/2 cup of spinach. Who doesn’t love watermelon? It’s delicious, refreshing, and hydrating – the perfect summer fruit. It’s also 92% water which makes it great for juicing! Carrots are renowned for their high beta-carotene content (the stuff that makes carrots orange). Beta-carotene is a powerful antioxidant for combating various diseases including cancers. This energy boosting juice is easy drinking and refreshing. The flavor is mostly watermelon with an earthiness from the beet. Lime, ginger, and mint are added to enhance the flavors and provide a refreshing twist! If you’re interested in more refreshing juices, check out this soothing aloe vera juice or this vibrant green goddess juice! Juice the ingredients. If you don’t have a juicer, add the ingredients to a blender and blend together with water. Once blended, strain through a cheesecloth. Hover over the photo to pin this recipe! « Vitamix 5300 vs. 7500 – What’s the Difference? This is my new fav summer juice ty!